Blount, BC, MJ Silva, SP Caudill, LL Needham, JL Pirkle, EJ Sampson, GW Lucier, RJ Jackson, JW Brock. 2000. 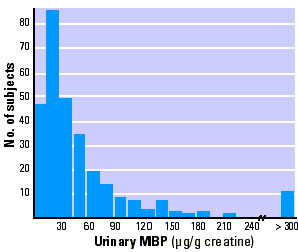 Levels of Seven Urinary Phthalate Metabolites in a Human Reference Population. Environmental Health Perspectives 108:979-982. Blount et al. examined urine samples from 289 adult Americans for fingerprints of exposure to seven phthalates commonly used in consumer products in the United States and elsewhere. Phthalate use in modern commerce is extremely common. One of their primary uses is as plasticizers in flexible polyvinyl chloride (PVC) products such as blood bags and children's toys. They are also used as as fixatives, detergents, lubricating oils, and solvents. As a result of these diverse uses, phthalates are found in many consumer products, such as cosmetics, as well as in applications, such as wood finishes, that inevitably create opportunities for exposure. With phthalate used virtually throughout society, the question Blount et al. addressed is whether the opportunities for exposure actual result in real exposures in people, and if so, whether the level of exposure is high enough to be a public health concern. They found widespread exposure at troubling levels. Most problematic, the subgroup with the highest level of exposure was women of child-bearing age, just the people public health efforts should keep out of the path of reproductive toxicants. What did Blount et al. do? Assessing chemical exposure to phthalates is difficult because contamination is amazingly widespread... so widespread that it even supposedly pure laboratory materials can be contaminated. Blount et al. met this challenge by developing a breakthrough technique that focuses on the metabolites, chemical fingerprints, of the phthalates. These metabolites are the chemical breakdown products to which the original phthalates are converted once they are processed by human body chemistry. They took samples from urine collected during the 1988-1994 National Health and Nutrition Examination Survey (NHANES III), randomly choosing 289 stored samples to analyze chemically. It is important to note (see below) that these samples were not from children nor from hospitalized patients using IV tubing or other medical equipment made from polyvinyl chloride. Blount et al. then established the concentration in these urine samples of "monoester metabolites of seven commonly used phthalates," i.e., the breakdown products. What did they find? They found that the phthalate monoesters with the highest urinary levels were monoethyl phthalate (MEP), monobutyl phthalate (MBP) and monobenzyl phthalate (MBzP). The presence of these monester metabolites reflects exposure to diethyl phthalate (DEP), dibutyl phthalate (DBP), and benzyl butyl phthalate (BBP). Likely sources of these exposures are through cosmetics, including hair sprays, nail polishes and perfumes. Further analysis showed that the distribution of contamination levels in the sample population including a small but significant number of individuals with high concentrations of MBP. This emerges from examining the figure below. Distribution of MBP contamination levels in sample. Note the unexpectedly large number of individuals with values above 300 µg/g creatine. Six of the eight highest levels were observed in women of childbearing age. A plausible but untested hypothesis is that these high levels result from cosmetics use, as this is a common application of dibutyl phthalate, the compound from which MBP is derived. What did they not find? The monoesters of two phthalates of current interest, di-(2-ethylhexyl) phthalate (DEHP) and di-isononyl phthalate (DINP), did not appear in high concentrations. (But see a recent study of Puerto Rican girls). These two compounds, especially, have been the focal point of some controversy because they are found in medical equipment and flexible plastic toys. One industry response to the Blount et al. study has been to highlight the fact that neither DEHP nor DINP were at high levels. They argue that the health concerns raised about medical equipment and plastic toys were therefore invalid. Industry's logic is flawed. The sample of people studied by Blount et al. included no children and is unlikely to have included recent users of IV tubes or other medical equipment with phthalate contamination. These results therefore say nothing about those controversies. There are also technical reasons, discussed in Blount et al., as to why the their measurements may give a low-ball estimate of exposure to DINP. Moreover, the concurrent publication of a study documenting 7x greater concentrations of DEHP in Puerto Rican girls suffering from premature thelarche demonstrates that the DEHP controversy is far from resolved by the results of the current research. What does this study mean? American exposure to phthalates is significant. Animal studies demonstrate reproductive toxicity at levels to which some people are clearly exposed. Phthalates are used widely in many unregulated products that fall through the regulatory cracks. These failures in regulation have created many untoward exposures whose health consequences we do not understand but could be quite important. The exposure of women of child-bearing age is especially troubling, as these compounds are particularly known for their ability to interfere with fetal development, especially in males. There may be a tragic irony in the fact that one of the pathways of exposure, cosmetics, is targeted especially toward women of reproductive age. By using phthalate-containing compounds in the battle of the sexes, they could be undermining the future sexuality of their male offspring. High level review of how the regulatory system allowed these exposures to be built into so many products is clearly warranted.